"A Piano makes Sound. A Pianist makes Music." - S.R. Lessons for students K-12 are offered year round. New students begin as soon as openings become available in the teaching schedule. A set lesson day & time are reserved for each student, usually one lesson per week. Young children and teens begin with 30 minute lessons, progressing to 45 and 60 minutes as skill level and attention span increase. 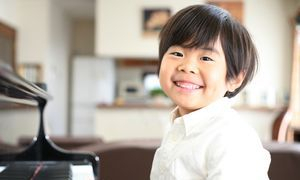 Private lessons for beginning through early advanced levels take place in the piano teacher's home studio, located in the Clintonville area of Columbus, Ohio. Free on-street parking and WiFi are available. Summer lessons are offered with flexible scheduling, allowing for camps, sports, family activities and vacations. Parents are always welcome to stay and observe lessons. A typical lesson for young children and teens includes note and rhythm reading, body movement, singing, composing, improvisation, solo and ensemble exoeriences with rhythm instruments, in addition to playing full sized acoustic and digital pianos with weighted keys. The correct body mechanics needed for proper piano posture, arm/hand gestures, and pedaling are monitored. All lesson content is age appropriate, with specific teaching materials chosen for each student based on their unique learning styles, individual needs and teaching goals. Scales, Technique and the Classics are always included, supplemented with Popular, Jazz, Sacred, etc. At each weekly lesson music concepts and skills are presented, taught, practiced and reviewed. The teacher and student set weekly learning goals together and practice instructions are written, discussed and sent home with the student. Concepts taught and reviewed at every lesson by the teacher, plus purposeful practice at home by the student, plus positive support given by the parent can equal a successful music experience for all. It is expected that each student will have either an intune acoustic piano, in good playing condition, or a digital piano with 88 full sized weighted keys, on legs or X-stand, plus a pedal and bench, at home for daily practice. The best progress in piano skill is gained with consistent daily practice, 10-60 minutes 5-6 times per week, depending on age and music level. Acoustic pianos do need to be professionally tuned at least once per year. Expect to budget $100-$150 per tuning payable to a Piano Tuner Technician of your choice. You can visit Pianos vs. Keyboards and Keys to Success for helpful information on these topics. Safety first: Parents - If you drop your child off for lessons, make sure the student is safely inside the studio front door before driving away. Return for pick up on time. The student will wait for you in the living room or on the front porch (not the sidewalk). Siblings may attend lessons if they wait quietly in the living room or front porch and an adult is with them at all times. Areas of the home open to students and families include the piano room, living room, bathroom and front porch. All other rooms, the garage and the yard are off limits. Missed & Cancelled Lesson Policies: All lessons canceled by the teacher will be rescheduled or credited to the student's account. Student accounts will not be credited for lessons missed or cancelled by the student/parent. Reschedule options are available: Saturday Open Studio classes are offered weekly. Or a weekday swap with another student may be possible. Let Sharon know your preference. Extended Absence: Please notify the studio if a student will be absent for 2 or more consecutive weeks. If not, the lesson time will be given to another student on the waiting list as needed. A student's current lesson day & time can remain available upon return by paying a nonrefundable Holding Fee. Severe Weather: Most times, lessons can continue as scheduled when school is cancelled due to weather. In Winter, the neighborhood roads are usually drivable by late afternoon. Plan to come for lessons unless you receive a cancel message from the studio. If you feel weather conditions make driving too dangerous for you, please call to arrange a reschedule option. Let's be safe. Of Course, Kids Get Sick: If the student is too ill to attend school, please stay home from piano lessons. When there is a diagnosis of Pink Eye, Strep Throat or any other contagious bacterial infection, please give the prescribed antibiotics for 24 hours before resuming lessons. Bacteria and viruses easily travel from student to piano keys to another student and the teacher in spite of Hand Washing, Sanitizers and Disenfectants. A Reschedule Option will be gratefully arranged if desired. Tuition is billed in 9 equal amounts from September 1 - May 31.
of the month will pay a prorated amount the first month. Payment is due by or on the first lesson of each month. of lessons scheduled from June 1 through August 31. Have Questions, Concerns, Want More Information? Sharon's goal is a response to all messages within 2 business days.